It’s going to be a few weeks more still before riders can finally board a new Orange Line train. That marks yet another hold-up for the debut of one of the transit system’s most highly anticipated projects. Officials previously pushed the train’s entrance to passenger service from late 2018 into 2019. In December, a T manager told the Globe that the train was on target to enter service by the end of January, although officials declined to offer a timeline in the weeks since, saying only that they were expected early this year. The T’s deputy general manager, Jeff Gonneville, on Monday told the agency’s governing board that nothing is wrong with the train, but testing of one component is taking longer than expected. This test is for a control system installed by the French company Alstom, which ensures trains are following the directions from the transit line’s signal system, which controls speed, spacing, and other aspects of service. While similar to existing subway cars, the new ones should break down less; wider doors should make boarding and exiting less chaotic. Alstom requires a third-party company to test the system before allowing the new train to enter service, Gonneville said. While officials were hopeful the train would be in service in January, Gonneville said, Alstom is now expecting it to take until mid-March. 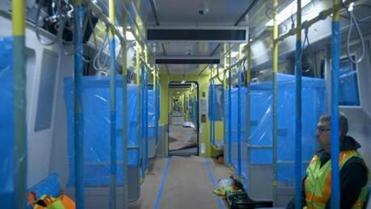 The T will be able to put the train into service a week or two after it is complete, he said. He said the T will try to expedite the process, but not at the risk of passenger safety. Gonneville said the delay applies only to the first six-car train, and won’t stall the rest of the other 146 Orange Line cars expected to slowly enter service through 2022. Subsequent trains do not need to undergo tests as strenuous as the first one, according to MBTA spokesman Joe Pesaturo. The second six-car train will now be scheduled to enter service shortly after the first one, Gonneville added. Officials have for months been conducting various tests on the first set, including overnight tests on the Orange Line’s railway. The T has also begun testing two additional Orange Line cars that it recently received from a factory in Springfield, where the Chinese company CRRC is building the new trains. CRRC is also replacing the Red Line fleet, with 252 new cars expected to come online between 2019 and 2023. The T has also begun introducing 24 new Green Line cars to service to supplement the existing fleet; the first was delayed by a few weeks due to a hiccup during testing.